Spiegelau Hybrid Champagne Flute for Ice Wine Too! Since I live in San Francisco and any real estate costs a lot, my cupboard space is valuable and the Spiegelau Hybrid Champagne Flute and its multiple uses comes in handy. Spiegelau is a brand under the Riedel wine glass brand. I bought mine on Amazon for 2 for $25, but I see now that I was lucky as they typically run a lot higher. I would have paid double for these knowing what I know now. My wine glass budget does cap at $30 a glass though since I have a clumsy boyfriend at home. So, why do I love the Spiegelau Hybrid Champagne Flute so much? Well, for a few reasons. The first being that I absolutely love bubbles, sparkling wine and champagne. I have around 4-5 wine club memberships at any given time and I always have at least one sparkling wine membership. It was first with Chandon until I realized I was buying their wines much cheaper at Bevmo and Safeway in San Francisco than I was getting as a wine club member (strange). It’s now Riverbench, which is a Santa Barbara treat! The other main reason I love the Spiegelau Hybrid Champagne Flute is because I’m a huge Ice Wine fan from my time living in Ontario, Canada. For the record, you can dislike sweet wines and still love Ice Wine. It’s an exception to the rule and Ontario Ice Wine is by far the best Ice Wine in the world. More specifically, Inniskillin Ice Wine is. Their Sparking Vidal and Cab Franc Ice Wines are to die for! Jackson-Triggs is the best bang for your buck, but Trius and Peller Estates are also must try Ice Wines. Inniskillin and Jackson-Triggs are both owned by Robert Mondovi. Anyway, to get to my point, Iniskillin as their own custom made ice wine glasses that are produced by Riedel and I’ve had a side-by-side comparison tasting at the winery to compare a regular champagne flute next to one of their Riedel glasses, and the tasting in the Riedel was the best by far. 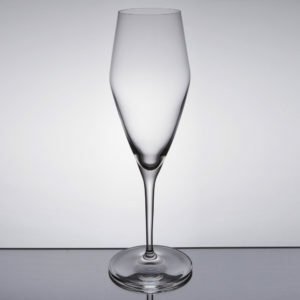 The shape of their custom made Riedel is a very similar shape to the Spiegelau Hybrid Champagne Flute or the Vinum Extreme Champagne Glass. because I drink champagne and sparkling wine much more than Ice Wine, I find the Spiegelau Hybrid Champagne Flute to be a much better investment for the different wine drinking occasions as they work for both.